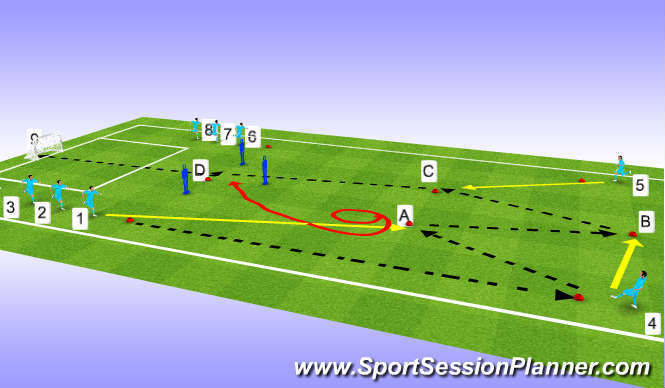 PLAYERS 1-5 RUN ROUND POLES AND AT (A-HEAD) (B-CHEST AND VOLLEY) (C-PASS) BACK TO FEEDERS PLAYERS MUST MEET THE BALL NOT WAIT FOR THE BALL. 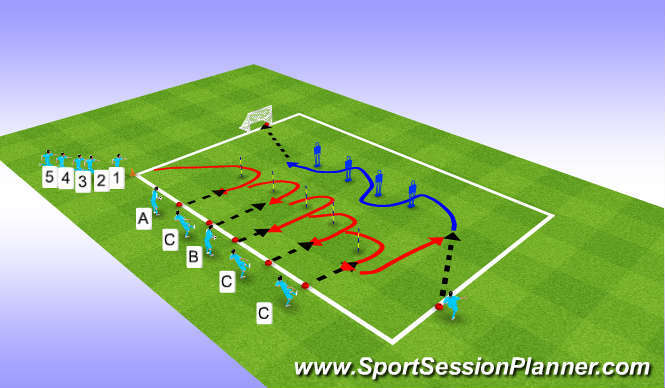 AFTER THEY GO ROUND THE LAST CONE THEY MAKE A RUN FOR D TO PASS A THROUGH BALL ,PLAYERS THEN DRIBBLE BALL ROUND MANNEQUIN AND SHOOT INTO THE GOALS (TRY AND HIT CONE AT BACK POST. 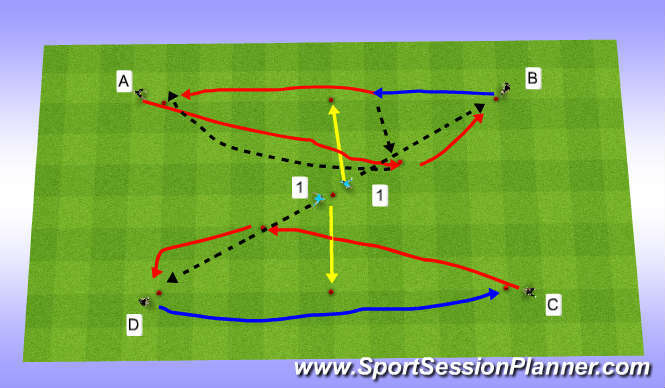 Mark out pitch into two outside 10M (A+C) areas and a central 20M (B). Split players into three teams of 4 Red, Blue, and Black. Place two red players in each end zone and 4v4 in the central area. 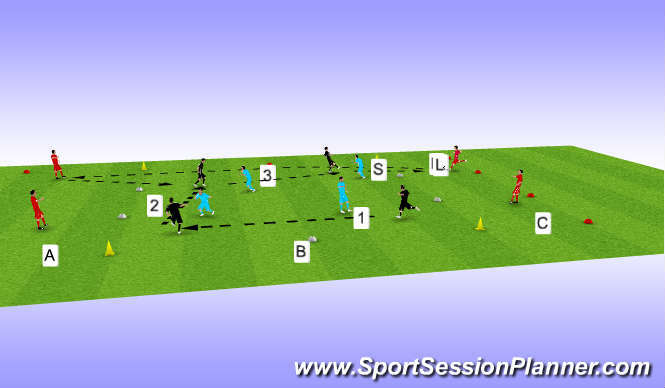 Maintain possession in central area with conditions Three/Five Passes Two/Three Touch then set one of the red players in end zone who switches play with lofted pass to opposite end zone. The receiving player reintroduces ball with short pass to team who set the pass and the game continues. Rotate end zone players and adapt playing size to standard of players and numbers. Encourage the players to work the ball with best pass selection and set the end zone player with quality to allow for one touch lofted pass. Encouarge end zone players to support central players with positional awareness and communication.